Coire Ardair is one of the most spectacular corries in Scotland, with the "Post face" rising 400m above Lochan a' Choire. 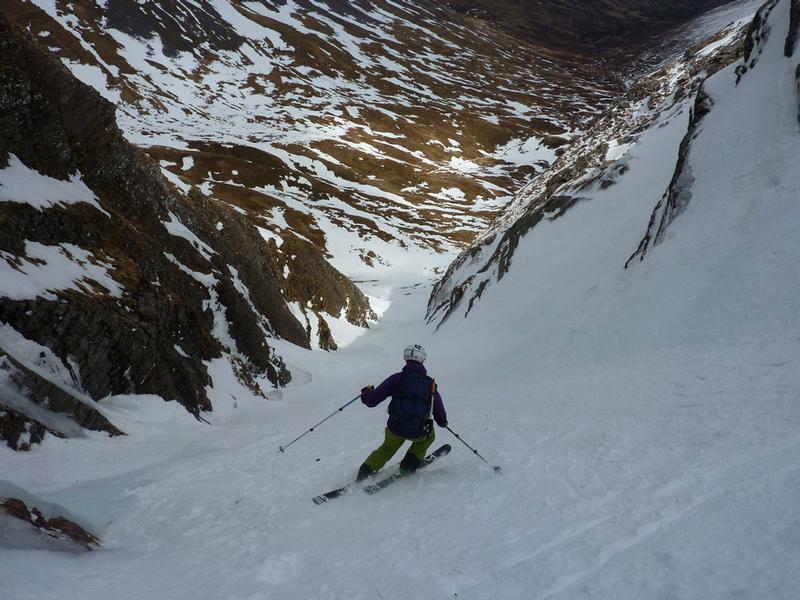 From the skiers point of view, there's a great high level tour round the tops of the corrie, but there are some fantasctic long descents to be had into Coire Ardair itself. There is an excellent path from Aberarder right into the corrie. This gives a great view of the cliffs, and all but Cinderella should be visible from the walk in. The ground to the east of Raeburn's Gully, beyond Bellevue Buttress looks interesting, as you can see on the left hand side of the main picture. There are several potential options for long descents. 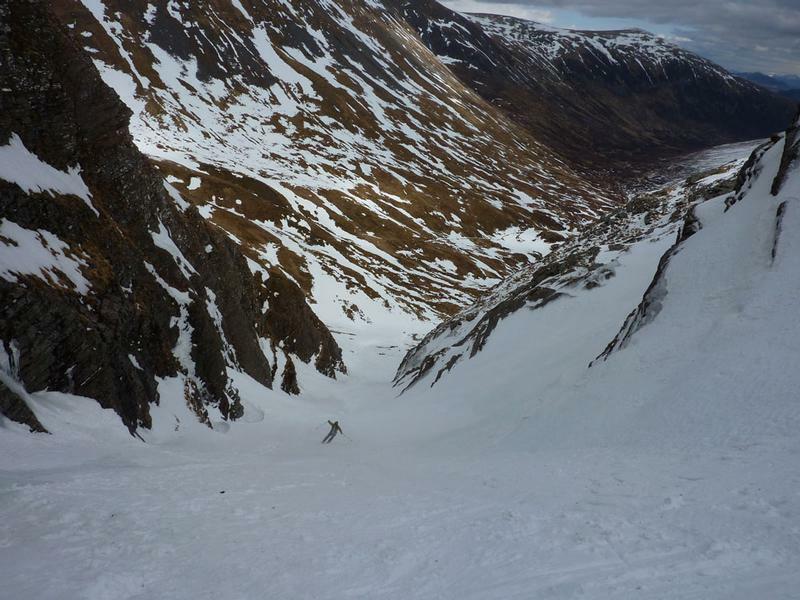 There is one relevant Scottish Avalanche Information Service forecast for Creag Meagaidh. Easy Gully is the large ramp that cuts below the "Post Face". In its upper reaches, it is more of a wide shelf, and only becomes gully like about a quarter of the way down. Initially, the descent should be started away from the cliff, but make sure you cut back left towards it soon, as the shelf degenerates into broken ground and then a cliff. You can cut back into the gully at a number of points, but do not leave it too low. The lowest reasonable point to cut in is opposite the sizeable icefall of "Last Post". The gully is initially a wind sculpted 1/4 pipe before narrowing and steepening slightly lower down. Hopefully, the scree fan below is covered with snow allowing you to get some big turns on your descent to the lochan. There are several big ice routes and usually some massive cornices above Easy Gully. After a thaw, the gully can be littered with ice and cornice debris. It is also prone to avalanche, and you can be avalanched from the gullies above, so be wary of this. This is also the main access to the ice routes, so it is possible you will encounter climbers in the gully itself. Raeburn's Gully is the parallel line to Easy Gully, but situated below the impressive Pinnacle Buttress. Unlike Easy Gully, it is quite narrow, and can be icy if conditions are lean. 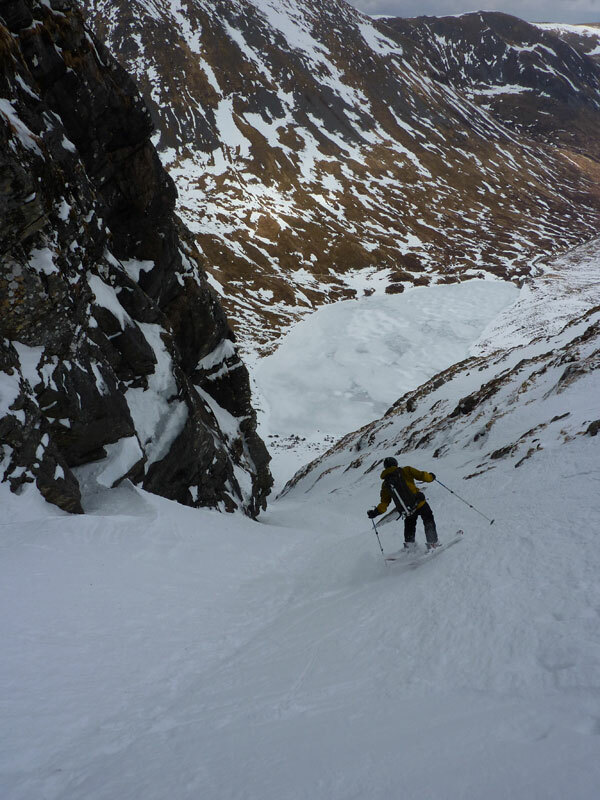 Entry to the gully is easiest on skiers right if the cornice allows. 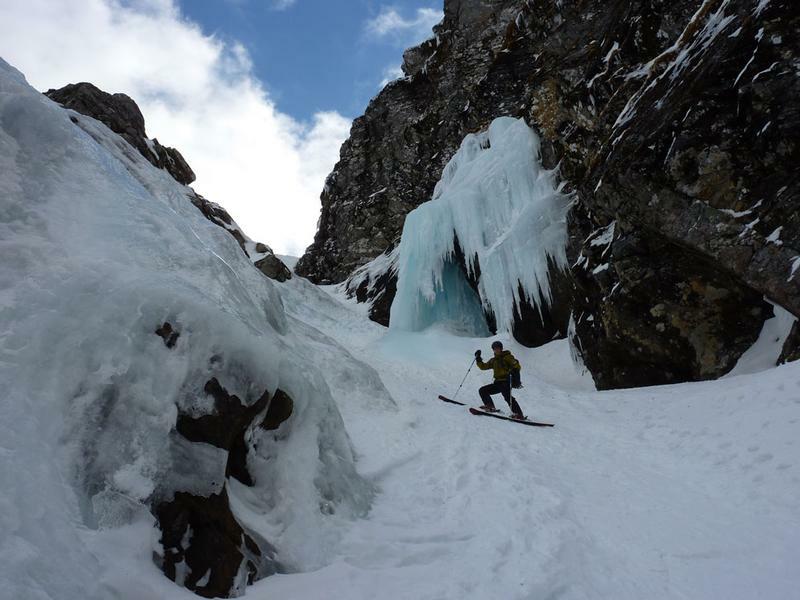 About a quarter of the way down the gully, there is a short narrow section, and just below thatis a sizeable icefall on the left known as the "Blue Icicle". It is often possible to pass behind it on foot, The snow around the base of the icefall can be covered in ice. 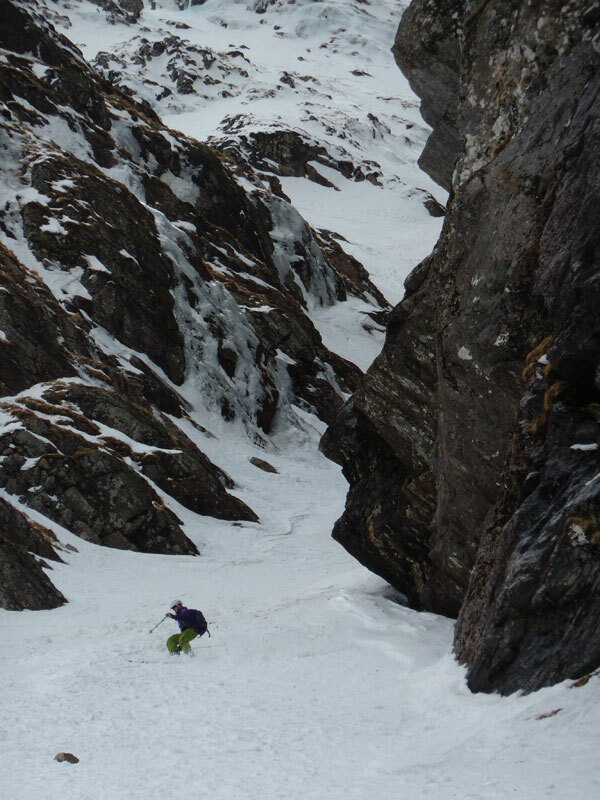 Situated high up in the "Inner Corrie", Cinderella is the deepest gully on the face. A Grade II climb, it often banks out to become a steep Grade I, making it an obvious choice for a descent. The cornice can be massive, but a slope just to the skiers right can allow easy access. This does however, start you above rocky ground, so you need to cut back into the gully almost immediately. Once in the gully, the descent should be straighforward. As you walk into Coire Ardair, you may notice the triangular face high on the right. Whereas most attempts at the pronounciation of the name of the corrie may not be great, the skiing is much better, and there are a couple of good options. If you can find a suitable entry point from the apex of the face, the most asthetic line is down the middle of the face. Alternatively, head down the Southeast ridge for a way, followed by a short drop into the corrie and you should be able to find a good way down down from there.